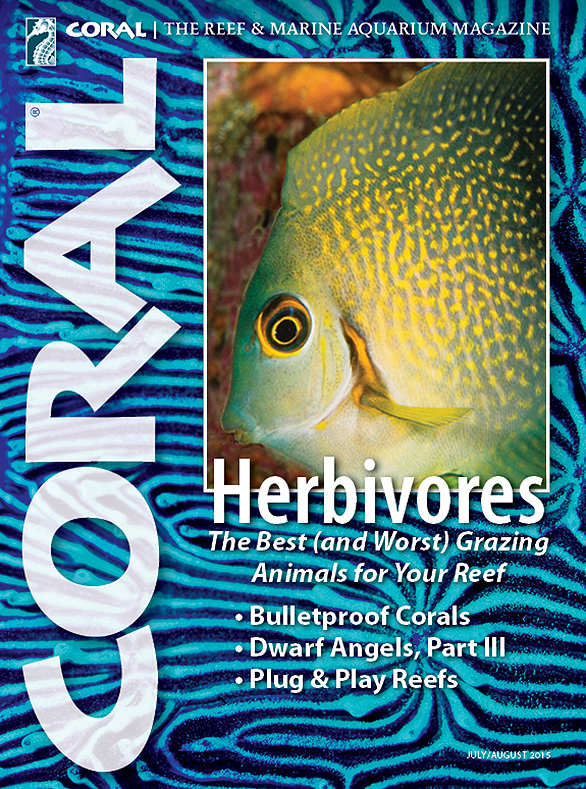 CORAL Preview: July/August 2015, Volume 12 Number 4. Cover image by Scott Michael/background by Daniel Knop. CORAL’s exciting next issue (July/August 2015—to be featured at MACNA 2015) will feature Herbivores that every marine aquarist and reefkeeper ought to know: Fishes, Snails, Hermit Crabs, Urchins and other grazers, large and small. Readable, authoritative articles by a lineup of CORAL experts will look the best—and worst—choices when choosing livestock to help control nuisance algae growth in the aquarium. Expert contributions by Scott W. Michael, Dr. Dieter Brockmann, Daniel Knop, Dr. Ronald L. Shimek and Prof. Ellen Thaler. And much more…. The July/August 2015 Issue of CORAL will be arriving in homes and stores during the last week of June and first days of July. Subscribers can anticipate at-home delivery of print copies in the coming days, followed by email links to the simultaneous Digital Edition. Subscribe to CORAL or buy Back Issues here. Image: Chocolate Surgeonfish (Acanthurus pyroferus) by Scott W. Michael.